Wedding Leaves Vintage Invitation Template is a new template PSD file for an amazing wedding invitation. Vintage, clean, simple and rustic design. Two different styles included. You can change the background easily. High definition, 300 dpi. CMYK colors. Template ready to print. Easy customization. Everything is included, you don’t need buy anything else. Free text fonts included too. 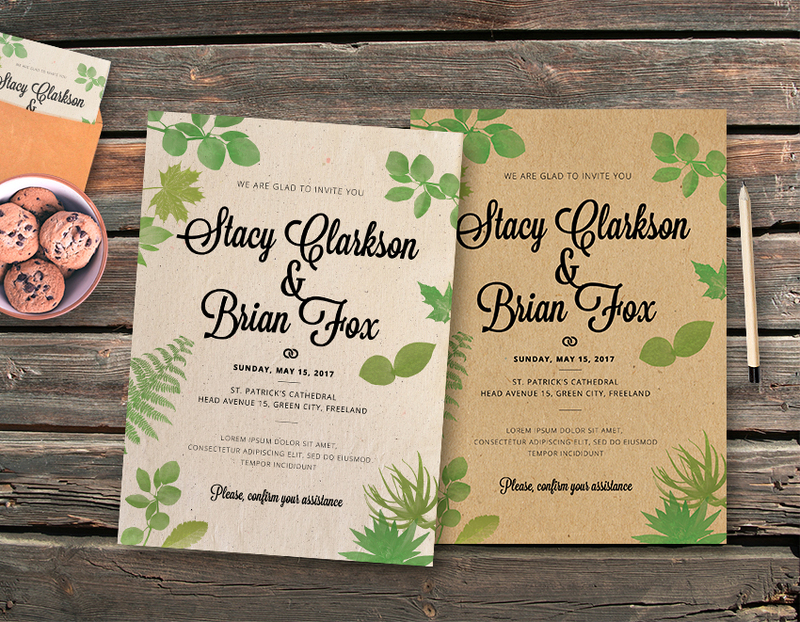 Get more invitations or templates for your weddings here or check another templates of Graphicfy. CMYK Colors. File Ready to print. All you see in the demo of this invitation design is included in the design file. As any Graphicfy flyer template, you can use this file unlimited times for any commercial or personal purpose, 100% Royalty Free License. You can learn about our license here. You can download this file for free and all the Graphicfy files. Become a member here and get access to all our files. Discover our amazing shop! Free and Premium outstanding files for Photoshop & Illustrator. Surf between hundreds of graphics and templates.